Running around, playing in the woods as a kid, nettles were something you tried to avoid at all cost. Nothing like killing the rest of your day (cue obbsessive scratching) cuz you ran bare-legged thru a patch of nettles. 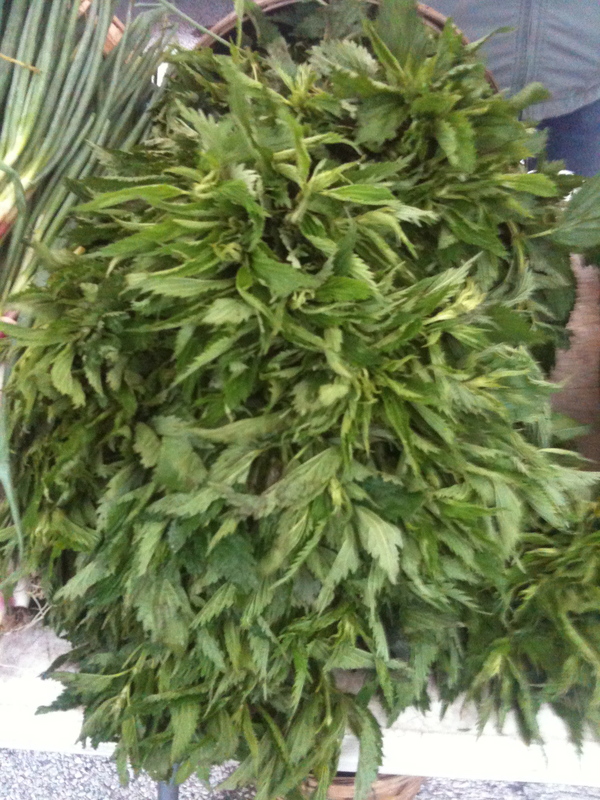 So while at the market yesterday, I found myself drawn to a mound of nettles (thanks to Green Acres Farm). Hum, never thought to cook with. I mean why would I want to bite something that thinks nothing of biting back? Wondering what they taste like I forgot all that I knew, broke off a leaf and proceeded with tasting…did you know that the little stingers on the nettle are at the base of the leaf? Yep, my bottom lip now knows. Witnesses (certain farmer and crew who shall remain nameless) to this and no one stopped me? Clearly I provide a bit of entertainment at the market at 6:30am. Hey, someone’s got to. After lots of chatting up of fellow-market goers, and recalling all the natural asthma and allergy remedies I have been reading about lately, I make the plunge and purchase a bunch of the nutricious stingers. Something good about it being a cold blustery day, my gloves were on. Thru-out Russia and most Nordic countries, after long cold winters, and nearing the end of wintered-over produce, some of the first signs of green and good for you came in the form of nettles. High in iron, antioxidants, and vitamins nettles are a true super-food. 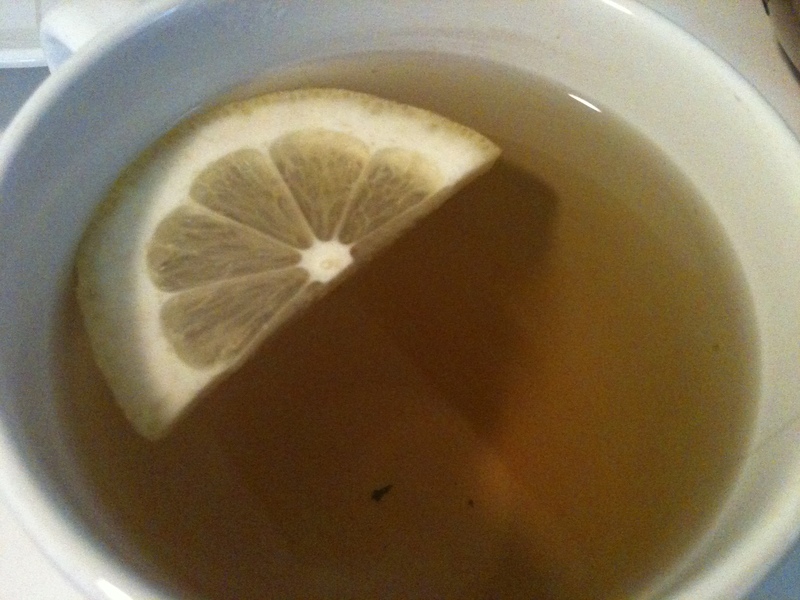 Steeped in boiling water nettle ‘tea’ (tisane) makes for a great overall health tonic. Heck, been drinking it for 24 hours now and already feel healthier. Who needs ‘The Master Cleanse’? Pesto, pasta, risotto, sauteed, and a variety of soups are some of the preparations I have found. 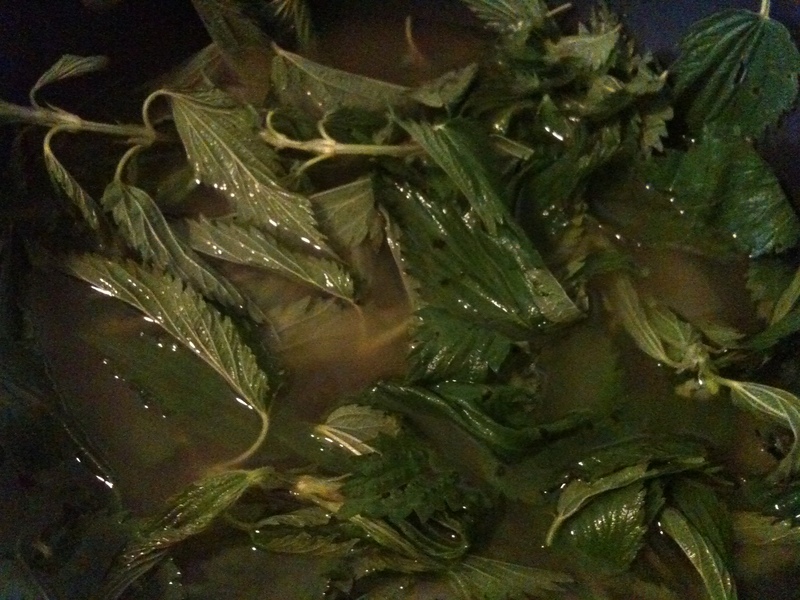 ALL, can’t stress enough, ALL preparations entail cooking (in boiling water at the very least) the nettles. Or did you forget my experience already? I haven’t, my lip was stinging for the entire day. Wait a sec’, maybe I am onto the next ‘lip plumper’…save that for health and beauty blog.. Since I have been on a pasta and rice tear the past couple weeks, and because the weather is back to feeling more like November, soup is the order of the day for the nettles. 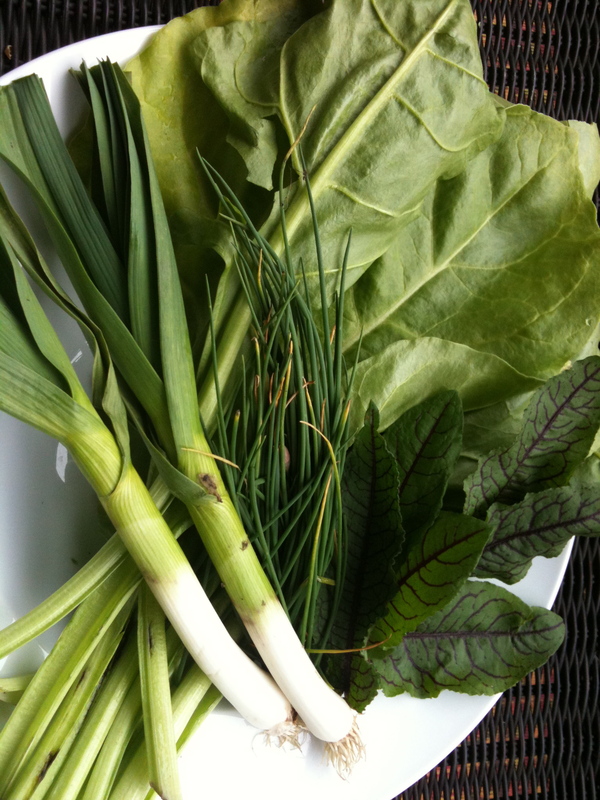 This version I concocted, came about from wanting to combine a number of other early Spring herbs and greens. So easy. So fast to assemble. So tasty. And sans a scant amount of butter and olive oil, low cal and healthy. 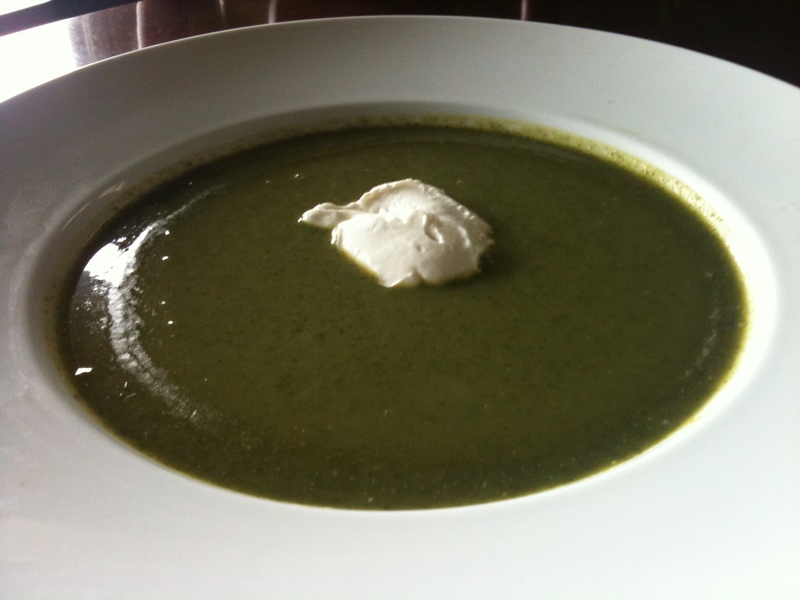 Thinking who needs that afore mentioned fancy detox diet, I am just gonna keep making and eatting nettle soup. Heat butter and olive oil in the bottom of soup pot. Add green garlic and onion and saute til tender. Add the nettles*, cover with chicken broth. Begin to warm over medium heat. Add potatoes, and spinach and cook until all veg are tender. Remove from heat. Add lemon zest & juice, sorrel, salt and pepper. With the aid of a ‘boat motor’ (aka handheld blender) puree. Serve in bowl with a dollop of yoghurt or sour cream, or better yet, creme fraiche, and a sprinkle of chive. Springtime in a bowl. *always handle raw nettles with gloves on. This entry was posted in To Market with Mo, Uncategorized and tagged Chicago Area farmers marekts, Chicago Farmer's Markets, Evanston Farmer's Market, Farmers Markets, fresh organic, fresh seasonal organic produce, Green Acres Farm, Green City Market, green garlic, Henry's Farm, Italian Spinach, leeks, moira's blog, Nettles, spring onions, Stinging Nettles, sustainable, to market with mo. Bookmark the permalink.